Jarreauniac! 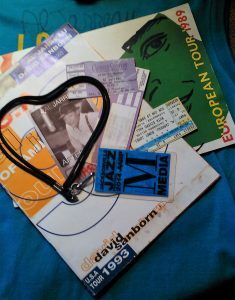 Concert memories from a wandering fan. The lead page for a piece I wrote for Abyss Jazz magazine. The layout was so beautiful and we got to hand that issue out at Jacksonville Jazz Festival. 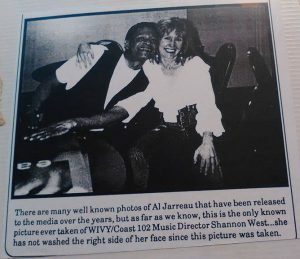 I went to a lot of Al Jarreau concerts between 1980 and 2015. Around 40 I think. He was always touring and he usually hit the southeast every summer. So I would hit the road and go see him. These are a few of the most memorable sometimes crazy sometimes magical moments. It would take a short novel to list them all. Perhaps we should create one..so please share your moments in the comments section below. 1. The first one. Charlotte NC 1980 My friend/Program Director and I had just moved from Florida to Asheville to put on a jazz/pop hybrid “soft rock” station. We were such newbies that we didn’t know you asked your record company rep for free tickets. So we spent the astonishing 10$ each for tickets and drove thru the mountains (scary) to Charlotte for what turned out to be one of the most amazing, memorable concert experiences ever. Leaving the show we ran into our Warner Bros. rep in the parking lot and she took us backstage. My friend did lots of different voices – he later went into voiceover and voice acting full time. I remember him and Al standing in back of the theatre just jamming on all the different voices they had between them. Driving back to Asheville we got lost in the mountains and went about 40 miles out of our way with the gas gauge sitting on empty and not an open service station in sight. We made it home safely and the car ran out of gas in my driveway. to the side of the dock. Someone in the bleachers started throwing roses in the water and people were picking them up and swimming to the stage to hand to him. Some were waving at him to jump in and had he not been tethered to a microphone and dressed to the nines we could see him looking at us like he was really thinking about taking the leap. 3.Orlando FL 1992 This was a dream band with Joe Sample on piano/keyboards and Terri Lyne Carrington on drums. After the show a group of media people and fans hung out backstage, then decided to continue the conversation in the hotel lobby which was across the street from the venue. Conversation pits were big back then and the lobby had several. There was a huge Christmas tree and the railings on the upstairs levels were covered with thousands of white lights. We settled into an area that had a piano and Joe Sample walked in, sat down and started telling stories from his life and his music while he played. Several office parties wrapped up and as people were leaving they stopped to listen. A small crowd gathered. Very few recognized Jarreau or Sample but they lingered and seasonal wishes were shared. For me it was healing, because my Dad had passed away a few years before during the holiday season and that makes it hard to get wrapped up in the cheer but sitting on that couch surrounded by musical friends and twinkling lights opened the door a little bit for me and reminded me that the season does carry magical moments. I don’t scrapbook. Really, I don’t. 4. Atlanta 2013 A Labor Day weekend free concert in the parking lot of an abandoned mall just south of Atlanta. It was raining but people were already setting up their lawn chairs while the band did their soundcheck. Guitarist John Calderon was on stage with Al playing his beautiful guitar solo that opened the live version of “Heart’s Horizon.” Such a true reward for those who came early to enjoy a stunning night of music under the stars. The next day on the way home I was stopped at a traffic light a rainbow ended on the hood of my car. Look To The Rainbow..sometimes you get to see that it leads right back to you. A fun little column I wrote for a radio trade paper. From back when radio people were passionate about music and more than a little bit crazy. Dream Guy Hall of Fame..yeah I said that. 5. Jacksonville Jazz Festival 2005. I am sitting on the front row with the editor of a magazine I used to write for. Behind us sits a local straightahead jazz advocate and radio show host who has spent years badmouthing the contemporary side of the genre and all those who love it. Al says hi to us from the stage, points to me and says “she knows jazz.” Jazz Police guy literally spits his drink. I’m so sorry, dear one..but music continued to evolve after 1955 and besides that, jazz was the music my parents danced to when they were young..it’s not all academic and serious. 7. Atlanta 1984 One year in the wild 80s he played an outdoor Amphitheatre in Atlanta the Sunday after a big radio convention was in town. This convention was basically 3 days of record company funded partying to celebrate the end of ratings season and they offered a few seminars and panels so stations could justify paying for us to go. On Sunday a few of decided on the spot to go see him. We staggered into a limo and when we got there we were told it was sold out so we would have to watch from backstage. Poor us, right?? Imagine!!!. 8. Atlanta again..do you see a pattern here. If it was summer in the 1990s and early 2000s it was Jarreau at Chastain Park. 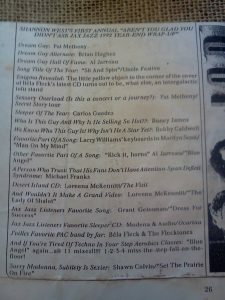 In 1993 it was a Jarreau/Sanborn tour. And the bands!! 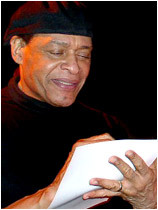 Jarreau had Neil Larsen on Keyboards – a favorite of mine since is solo albums in the 70s. Terri Lyne Carrington on Drums, long time musical partner Larry Williams. Sanborn had percussionist Don Alias, guitar hero Dean Brown, Michael White. Just two sets of stellar musicians. The season ticket holders in the front area were oblivious to this. They clanked their glasses, ate their picnic dinners and talked among themselves so loudly they overwhelmed even a perfect sound mix. I saw this little spot of grass close to the stage, moved there and sat down..and started to feel stings. I had plopped right into a fire ant bed and I was wearing a skirt. Welts..lots of lovely welts. It was quite the conversation starter. Writing a note to a fan after the show. That made someone very happy! 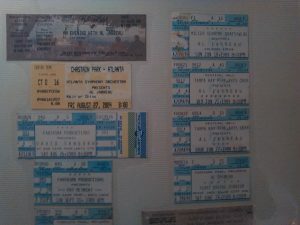 9/ Jacksonville, FL 1998. 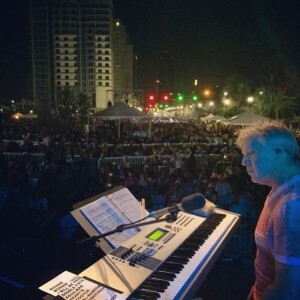 Al singing with the Jacksonville Symphony – an elegant evening under the stars with candlelit tables and upscale catering. I had run a contest on my radio show for the winner to get seated in the VIP and meet him after the show. She and her husband were obviously having issues so she proceeded to drink quite a bit, then they had a fight (fortunately not during a quiet song) and he left. By the end of the show she was pretty much plotzed and in quite the mood. When we got to the meet and greet she staggered toward him and took the tablecloth from a food table with her. Then she pretty much lunged at him. He was so gracious! He literally caught her and held her up, led her to a seat and they had quite the conversation. She called me during my show that week and said she was going through a really difficult time and just meeting him and hearing his music gave her the strength to make some hard decisions about moving her life forward.. Cutting up again. April 2015. Orlando FL 2015 – This would be the last time I saw him in concert. The venue was set up to feel like a smaller room that it actually was and he was digging deeply into the meaning of the songs and connecting with the audience on a very intimate level. I was on the front row, sitting literally 3 feet from the stage but it wasn’t just me that felt that. Several friends, even one on the back row, said they felt that same connection. The band was on fire – all world class musicians who had been together so long they read each others minds. I had not intended to go but I got an unexpected Christmas gift of cash, just decided to hit the venue website to see what was available and there was one seat on the front row that cost the exact amount that I had been given. Yeah, there are things much bigger than us in play. I said that about the first time I saw him and it held thru to the last. 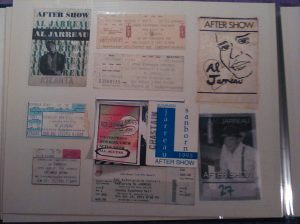 I believe it was 1980 and Jarreau was on the This Time Tour. He was going to do a concert at the Greek Theater in my hometown of Los Angeles. I was in junior higher and I could not drive. 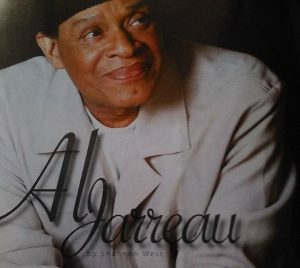 So, I got my dad to take me to my first of many Jarreau concerts. The show was awesome! I loved how he made everyone feel. The good vibes were definately contagious! Anyway, my dad had the brilliant idea for us to leave early so we could beat the traffic. Well, he forgot that the Greek Theater stacks the parking. So? We were stuck! And when I thought the show was almost over, Jarreau went on for about another hour! We ended up listening to the rest of the performance from the car. Needless to say, I never again left a future Jarreau concert early!